Wow! You’re almost on the fourth day of the GM diet chart. It is just half way to complete your goal. On this day, you’ll be surprised to know that you can actually eat your favorite bananas. From the Day 1 to 3, your body has been cleansed and have adjusted itself to the GM diet routine. Your body has got all the sugars and fibers it needed from the fruits and vegetables. By adding bananas and milk to your diet regimen, you’ll be getting the Potassium and Sodium which you missed during the first three days. On day 4 of GM diet, you’ll get your energy from milkshakes and vegetable soup. How to Prepare Your Body for GM Diet Day 4? It is very easy to prepare your body for the day 4. Since your body has a sustained appetite, it no longer responds to the taste of Bananas and so you can easily survive on liquids. As you already have enough energy for the day, you can see a lot of changes in your activities and you’ll feel a livelier attitude towards life. What to Eat on Day 4 of GM Diet? 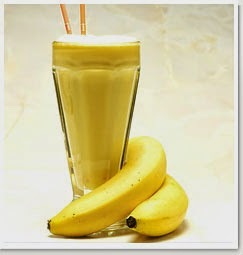 Breakfast: You can start your day with a banana supplemented with a glass of milk (warm). Note that you can also use Skim milk instead of the fat milk throughout this day for better results. Lunch: Try to have vegetable soups such as tomato soup and cabbage stew. These soups would savor your taste buds for sure. Dinner: You can have a vegetable soup along with a milk shake. If you feel vegetable soup itself is enough to fill your stomach, you may skip the shake. Snacks: Nothing except bananas and milk shakes. Have a large Banana paired with 1 glass of warm milk (250ml). Eat a large bowl of vegetable soup. Consider either the soup made from Tomatoes or Cabbage. Get yourself a vegetable soup + 1 banana. Whenever you’re having the food cravings (hungry), try to eat a banana or have a glass of banana shake in between the meals like said in the sample diet. No more than 4 large or 6 small bananas are allowed per day. You can also drink almond milk or soy milk as an alternative to milk, but make sure you limit your intake as they contain more calories than the regular milk. Drink enough water per day. Boil together all the ingredients such as cabbage, onion, peppers and celery in water along with some salt, pepper and herbs to add some flavor (0% fat). You can also add a few other vegetables except beans as they could add up extra calories. Stir the mixture and serve hot. 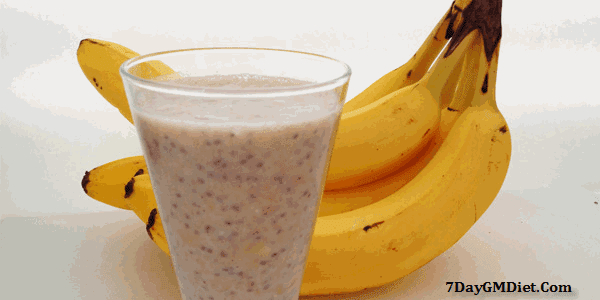 How to Prepare Milkshake using Bananas for Weight Loss? First, pour all the ingredients into the blender. Mix in blender for some time until all the banana pieces blended nicely. Pour the juice in a glass and serve chilled. Note: You can eat up to 6 small sized or 3 large sized Bananas on day 4 along with 750 ml of skim milk (250 ml per serving). Another great alternative for skim milk on the GM diet is the almond milk. The almond milk is lower in calories and so most people include it in their calorie-controlled diet plans. So, the main confusion arises at this point. Which is best for weight loss – Skimmed milk or Almond milk? In this article, let us find out the pros and cons of both the milk types and decide which milk is best for losing weight. First, let us take a look at what the Almond milk has to offer in terms of weight loss benefits. 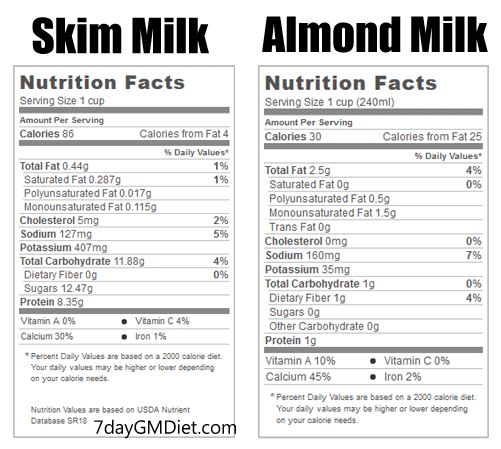 As we discussed earlier, the almond milk is very low in calories compared to skim milk. So, it is no surprise why most people consider almond milk while dieting. A cup of almond milk (without sugar) contains just 39 calories, while the same cup of skim milk has around 91 calories. So, by just switching to unsweetened almond milk instead of skimmed milk will save about 19,000 calories in a span of 1 year (considering you drink a glass of milk on a daily basis). That means you’re literally losing 5.5 pounds (or 2.5 kgs) in a year without doing anything extra other than switching to a low calorie drink. Isn’t it cool? Do note here that this logic applies only if you drink almond milk without adding sugar. As the sweetened almond milk has around 91 calories in a cup, which is almost similar to the skimmed milk. So, if you want to lose weight, only consider the unsweetened version. When it comes to protein, skim milk has about 9 grams of protein, which is pretty high when compared to 2 grams in a cup of almond milk. Here, the actual logic begins. Since, the protein gets digested slowly, our body has to burn more calories digesting the milk than almond milk. This is where the skim milk surpasses the weight loss benefits of almond milk. By the end, both the skim milk and almond milk does have distinct advantages. While the almond milk is low in calories, the skimmed milk has more calorie-burning properties (more protein = more calorie burn). So, don’t just go by the calorie count as you’ll also need to consider the nutritional benefits of the foods that help you lose weight without affecting your health in a bad way. Both the milk types are good for health, but when you’re trying to lose weight, then skim milk is the better option. Here is the thumb rule – Skim Milk for Weight Loss & Almond Milk for Maintaining Lost Weight.